Scientists Fear Ecological Disaster In Nicaragua's Planned Canal The head of Nicaragua's Academy of Sciences says the plan for a new Central American shipping channel seems so crazy that he's having trouble persuading conservation groups to take it seriously. Scientists are raising the alarm about the possible environmental consequences of a huge shipping canal that could cut across Nicaragua, from the Pacific to the Atlantic. The government of this Central American nation has signed a deal with a Chinese company that is planning to build a maritime shortcut that would compete with the Panama Canal. Construction could begin next year — yet there's no official route for the canal and no assessment of its potential impacts on the environment. So far, the plan hasn't triggered much concern among international conservation groups. There have been many plans in the past to build a canal across Nicaragua, and none of them has borne fruit. But this time could be different. And it's not a modest proposal. "To compete with the Panama Canal, this has to be a huge canal in terms of the width and depth," says Axel Meyer, a biologist at the University of Konstanz, Germany. He's been conducting fieldwork in Nicaragua for 30 years. He says the canal would cut the country in two, creating a biological barrier. 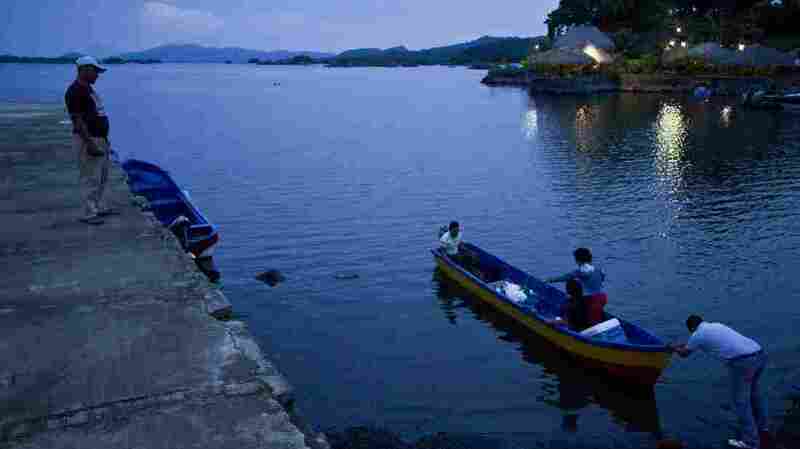 And the route would traverse the largest source of freshwater in Central America, Lake Nicaragua. "That entire lake would have to be dredged and kept open during the operation," Meyer says. "And that's something that's a major concern in terms of sedimentation and the whole impact on the wetlands around the lake." "It's unfathomable for me to envision these huge ocean liners and ships going through these small streams. In the dry season you can walk through there, drive your car through there." He's also concerned about oil spills and the introduction of nonnative species, which can disrupt the indigenous populations of fish and other organisms. Connecting the lake to the Gulf of Mexico to the east would presumably follow the trace of one of the small river systems. Meyer went out last October to look at some of the possible routes. "It's unfathomable for me to envision these huge ocean liners and ships going through these small streams," he says. "In the dry season you can walk through there, drive your car through there." To voice his concerns, Meyer co-wrote a commentary in the journal Nature with molecular biologist Jorge Huete-Perez, from the University of Central America in Managua. Huete also heads the Nicaraguan Academy of Sciences. "We don't really know what's happening," Huete says about the rapidly evolving and secretive plan. "We just know the concession was given to this company. There were no environmental studies. And they're doing their own environmental study." Huete says that's a conflict of interest. So far, the company hasn't even said what route the canal would take. Yet it plans to have the environmental assessment wrapped up quickly, so construction can start next year. "Most of our experts are saying that you would need two or three years and many, many people working on this to be able to complete these studies," Huete says. "And yet they want to do something in three months." The Chinese company that's running the project says it's hired a firm called Environmental Resources Management to do the assessment. Its offices in Washington and Houston didn't return NPR's phone calls. The canal also seems dubious because it would be a much longer and slower route than the Panama Canal. Huete says the plan seems so crazy, he's having trouble persuading global conservation groups to take it seriously. "People are not really paying attention because they think this isn't going to happen," he says. "And yet this might be part of the problem." It may be speeding forward because there is no vocal opposition. Carl Meacham, director of the Americas program at the Center for Strategic and International Studies, says there are huge risks if the project does advance without regard for international legal and environmental standards. "I think that would be quite negative," he says. "And I think the United States and other countries will voice their opinions. And this should be relevant to the people who are financing this project." Nicaragua is one of the poorest countries in the Western Hemisphere, so it's not hard to understand why the country would want a project that could bring jobs and other economic activity to its shores. Meyer hopes that Nicaragua will instead follow the lead of its neighbor, Costa Rica, which does a booming business in eco-tourism.